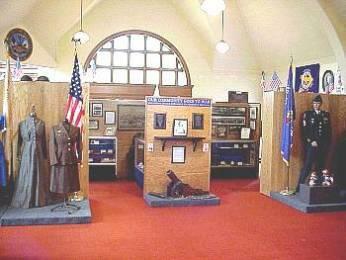 Under the guidance of Board Member Robert Frankenstein, the Dodge County Historical Society was able to open its Veteran's and Homefront permanent exhibit in November of 2001. The exhibit tells the story of Beaver Dam men and women who contributed to the preservation of peace throughout this country's struggle to maintain freedom. The exhibit contains literally thousand of artifacts dating as far back as the War of 1812 to the current War on Terrorism. For the first time, the museum is able to display innumerable items from the Civil War, Spanish-American War, World War I, World War II, the Korean War, the Vietnam War and other areas of conflict involving American men and women. But the exhibit also reveals the personal struggles of those who stayed back to ensure the United States stayed strong on the homefront. The personal stories from the men and women of the Beaver Dam area have been compiled for reading in the exhibit reading area. 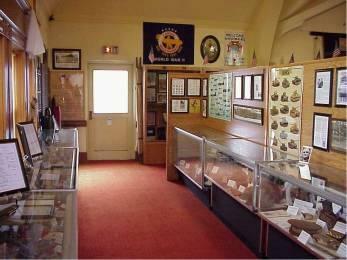 We welcome all to come, enjoy and learn from this extensive exhibit.